A.S. Transfer Senator and attempted A.S. presidential candidate Joseph “Joey” Giltner spent at least $968 more than the allowed amount for candidates and took steps to conceal his spending, according to information the UCSD Guardian has obtained from multiple sources. Giltner never appeared on the ballot after being deemed ineligible to run and later disqualified, though he appealed these decisions for the duration of the election period. According to section 4.2 of the election code, slates and independent candidates are limited to using $2,300 of their own income on the election. The official number that Giltner listed for total expenditure was $1,123.96, with $137.35 coming from donated items, but documentation indicates that Giltner underreported his spending and that the actual figure surpasses $3,200. Prior to his current term as a senator and his presidential candidacy, Giltner was involved in A.S. Council when he first attended UC San Diego from 2013 to 2016. He left the university to “pursue a career in corporate America,” but re-entered at the start of this academic year after attending California State University, East Bay and UC Berkeley. Giltner announced his run for president of A.S. Council on March 16 as part of the slate Tritons United, which he assembled and headed. However, after Giltner filed his candidacy, it was determined that he was ineligible to vie for the position, which he told the Guardian was a result of not meeting the 2.5 minimum GPA requirement. Giltner appealed to have his transfer grades included in the calculation to become eligible, which the Judicial Board granted on April 10. Despite the favorable ruling from J-Board, the Elections Committee had already disqualified the Tritons United slate and consequently Giltner from running on April 8 due to multiple violations of the election code committed by Giltner. The other Tritons United candidates disassociated from the slate on April 7 and were permitted to run as independents. According to the election code, candidates are required to provide records of all campaign expenditure to the A.S. Elections Committee, and based on an investigation of the spending report for Tritons United that was written by Giltner, Giltner doctored some of the receipts he included to deliberately conceal the true amount he spent on at least three listed expenditures and failed to report at least five other purchases for which he was required to by the election code. In addition to numerous supposedly donated items, Giltner alleged that he purchased 115 shirts for $431, $98 for a custom Tritons United Snapchat filter, 16 2’ x 4’ banners for $156.60, 2,500 stickers for $117.23, and 2,000 rave cards for $183.83. 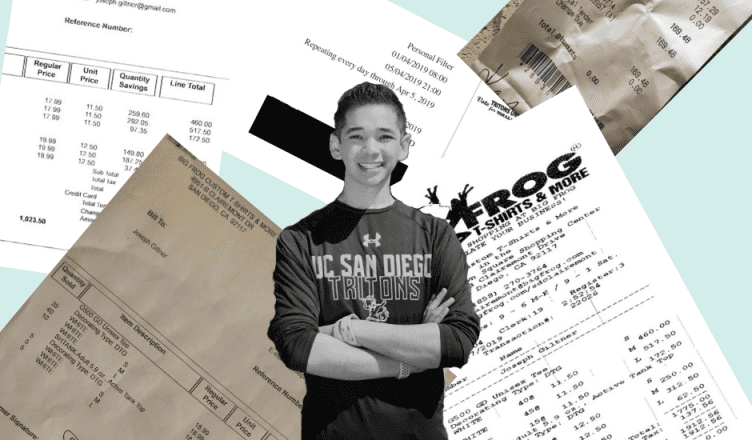 The Guardian received the receipts he entered with the Tritons United spending report to prove his purchases for the shirts, banners, and Snapchat filter. “We never received payment for that invoice,” the employee, who also responded to a quote request from the Guardian, wrote to Grudin. A partial photocopy of an invoice and a photocopy of a receipt printed from a cash register at the store that were given to the Guardian by former Tritons United member Danielle Viviani reveal that the true cost was a total of $1,912.56 for 100 t-shirts and 50 tanks, including tax. At a unit price of $8.95 per 2’x4’ banner with next-day turnaround, the 16 banners were purchased by Giltner from Digital Room, Inc., according to the screenshot of a receipt that Giltner provided as evidence of his spending. This receipt was fraudulent as well — using the item number listed on the receipt, the Guardian received a copy of the original invoice for Giltner’s purchase from NextDayFlyers.com, a subsidiary of Digital Room, Inc., which states that the unit price was actually $28.95, including tax, and the total was $507.20, more than three times the cost Giltner reported. Giltner attributed the higher cost on these receipts to the fact that some of the receipts may have “a bunch of items combined.” However, he did not elaborate on what these other items would be and why they differed from the receipts he submitted This also does not account for the fact that the number and type of banners he reported buying from Digital Room, Inc. are the same as the number and type of banners on the actual invoice. The underreported cost of the Snapchat filter was the only incident of alleged false reporting actually heard by the A.S. Elections Committee. In a grievance brought by Grudin, Grudin provided photographic evidence of the custom Tritons United filter outside Starbucks, in front of Geisel Library, by Center Hall, and inside the Guardian’s office in the Original Student Center. Grudin additionally submitted a screenshot directly from Snapchat’s website showing the cost of a custom filter throughout much of the UCSD campus to be approximately $400 instead of the $98 Giltner listed. This evidence was accepted by the Elections Committee, which found Tritons United to have violated the election code. While the filter map done by Grudin extends to parts of the campus beyond what she provided photographic evidence for and what Giltner himself submitted as the covered area, the Guardian found that even using roughly the same area as Giltner, which only covers part of Price Center, Library Walk, and the entrance to Geisel Library, the cost would still surpass his reported amount and actually be around $187. According to Giltner, this discrepancy is because he used personal connections to create the filter. He declined to provide evidence of this, stating that he wants to preserve these connections. “I do work in a nightclub, and so I was able to use professional connections that gave us really good deals,” Giltner told the Guardian, referencing the low costs of his purchases in general. Giltner did not specify which items the deals were for or how they related to the inaccurate receipts. Without the receipts submitted by Giltner for the rave cards and stickers, the Guardian was unable to verify the costs he reported for either item. In addition to falsifying the Tritons United spending report and some of its accompanying receipts, Giltner also failed to report purchases for 15 picket signs, 15 additional banners, three photographers, one videographer, and Tritons United shirt pins, Viviani told the Guardian. The cost of the pins, banners, videographer, and two of the photographers is unknown to the former Tritons United members, but one of the photographers disclosed to Viviani that he received $450 from Giltner for his work. As the work from the photographers and videographer was not received until April 1, Giltner explained to the Guardian, he did not have to report it for a full week in accordance with the election code, which is why it does not appear on the report. As of April 15, there is still no entry for these services listed in the Tritons United spending report, and as early as March 11, professional photos with credits to Amanda Lam were posted of the candidates on the Tritons United Facebook page. Giltner’s claim that he had a week to inform the Elections Committee of purchases is also false — A.S. Elections Manager Kyler Vaughn informed the Guardian that due to Tritons United’s violations of the elections code, they actually only had 48 hours to report spending. The picket signs were $22.47 each, according to a receipt from former Tritons United candidate Karsyn Stewart. Stewart paid for seven of the signs, which appear on her receipt, and Giltner covered the remaining eight, adding an additional $179.76 to his total expenditure. Giltner told the Guardian that both the picket signs and pins were not actually used during the course of the campaign and therefore did not need to be reported. Viviani confirmed that the signs were likely not carried, nor were the buttons distributed, and Vaughn confirmed that purchases not used do not need to be entered into the spending report. “I would have recorded the items if we had the chance to use it, but we never had the chance to use it,” Giltner said. Using Giltner’s listed prices for the Snapchat filter, rave cards, and stickers and not including the picket signs, Giltner definitively spent at least $3,268.87, or more than $968.87 over the spending limit, not including the price of the remaining banners, two photographers, and videographer for which the costs are still unknown. The former members of Tritons United collectively believe $3,268.87 is likely only a fraction of the amount Giltner actually spent throughout the election. “We are in agreement that we believe Joey spent, conservatively, $4,000-$5,000,” Viviani said on behalf of the disaffiliated candidates. Viviani expressed that it is unclear to her why Giltner went to such lengths during his campaign. “I may never understand why $4000+ was spent to win an AS position, but at least that same individual who falsified receipts to hide said spending from the disaffiliated members of [Tritons United] and the rest of the student body will never be able to control the $6,000,000 AS budget composed of all of our student activity fees,” Viviani stated. Due to being held in violation of the election code for also booking a spot for Tritons United on Library Walk through his position as an A.S. senator, Giltner is set to be impeached at the next A.S. Senate meeting, Grudin told the Guardian.